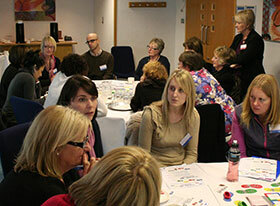 Are you keen to make progress with co-production, but not sure how to start? The transformation of public services and the increasing shift of power and responsibility from the state to the community, is a an exciting, daunting, evolving agenda. Holding a Whose Shoes?® session provides a relaxed, informal way of getting people around the table to build relationships and trust... and then the tool itself enables you to open up 'crucial conversations' and make progress. enable key partners to work together as equals! understand how change affects different people – step into their shoes! explore key concerns in a safe environment - is it possible to improve lives AND save money? exchange examples of good practice – what are other people doing to make it all work? 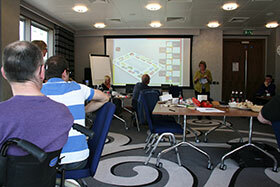 Strategic Facilitator of Person-Centred, Outcome -Focused Assistive Technology. Here are a selection of testimonials from different perspectives… imagine these people sitting round the table and working TOGETHER! Sessions are lively… and powerful! Whose Shoes?® has received great reviews throughout the country and is widely renowned as a genuinely useful tool for helping people to think about the bigger picture, and how personalisation can be realistically achieved"
I was blown away with how much any one person coming from whatever perspective can gain in knowledge by playing a game in the right context (training days/ presentations & interactive workshops etc)"
Whose Shoes?® was an excellent tool to use as part of our Inter-Professional Learning Workshops with nursing and Social Work Students. It really helped the students to explore each other’s roles and it helped to create really useful discussions regarding partnership working"
The impact Whose Shoes?® can have re developing User and Carer knowledge and understanding about the personalisation agenda is fantastic - and with the additional social outcomes it has for partnership and peer learning - it's phenomenal. People absorb more when they are having a good time!!!" This is an excellent way of exploring the range of views held in relation to personalisation. It is fun, non-threatening but very challenging. It’s a great teaching tool"
It has always proved powerful in creating opportunities for participants to 'locate' their personal insights within the wider context of citizenship and participation, and to focus their contributions effectively. 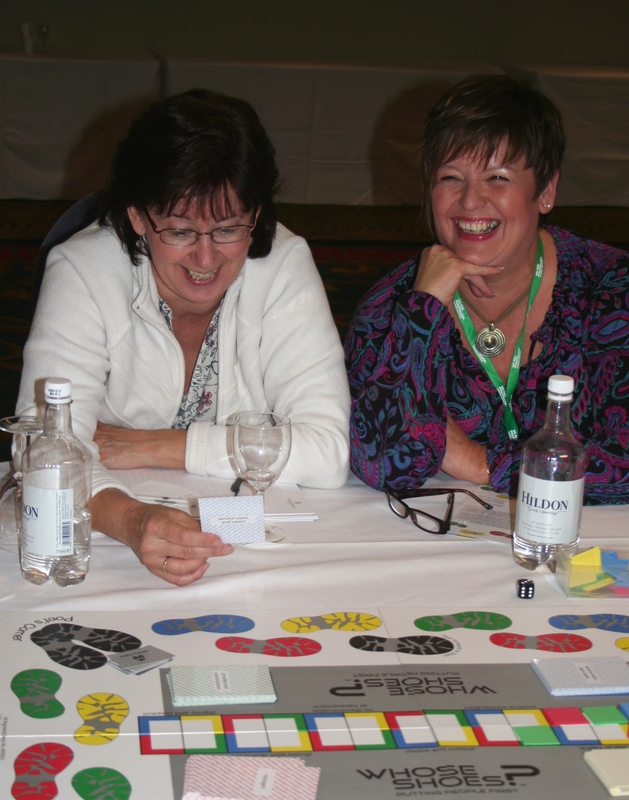 Gill is a very creative, person-centred worker whose board game Whose Shoes?® is an excellent tool to stimulate discussion, and sometimes argument, in addition to enjoyable learning around all the key issues and themes of personalisation. Her creative scene setting is worth participating in if you get the chance". Social Work Advisor, Oldham Metropolitan Borough Council. Personalisation and joined-up services - Now it's time to Make it Real - for everyone! Many Local Authorities in the UK are using Whose Shoes?® It provides a powerful tool to explore issues internally and with partners. It is a popular way of starting the co-production - getting people together and enabling them to explore the changing landscape of social care and health as equals. learn examples of good practice – what are other people doing to make it all work? The electronic version of Whose Shoes?® has been built in partnership with Think Local, Act Personal (TLAP) aligned to the key themes, principles and 'I' statements of 'Making It Real'. We encourage relevant organisations to sign up to 'Making It Real' and to use Whose Shoes?® to work with people using your services to identify your 'top 3 priorities' ... And then move on to co-produce truly person-centred solutions. 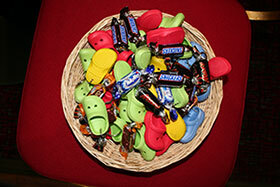 Whose Shoes?® has been very well received in Newham. In July (2010), we will be focusing on Self Directed Support as part of the Mayor's town show. 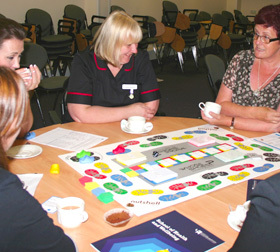 We will be using the board game to assist members of the public to ask questions and participate." We really liked the idea that you weren't playing in competition with each other, but as one team, driving to co-deliver changes to adult social care." ... a very different way to engage in conversations / capture issues with regards to Transformation." Feedback from the staff reference group was very positive. 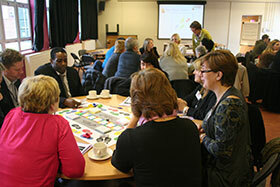 The game generated a lot of discussion from different points of view and helped staff to see the bigger picture. Discussions were more informal and interactive than generally occurs at large meetings and staff found the experience enjoyable and beneficial…"
The feedback was very good – we particularly liked the way in which the cards prompted lots of discussion (too much at times!) and that even people with no prior knowledge of personalisation were able to contribute. We are using the game as part of our training programme"
Whose Shoes?® is the best facilitation tool I have seen in over 30 years in social work"
I've played Whose Shoes?® to learn what it was all about and found it extremely useful. It's a really useful tool to help spread the personalisation message!" We are still using Whose Shoes?® in personalisation training with internal and external staff - the feedback they give is very positive and it breaks the ice during the training session"
Whose Shoes?® should be a mandatory exercise for all involved in personalisation!" Person-centred, integrated services - Now it's time to Make it Real - for everyone! Whose Shoes?® is being used increasingly by NHS and other health providers in the UK. It provides a powerful tool to explore issues internally (e.g. a team away day) or to work with partners to develop integrated care pathways. It is a great tool for starting the co-production process - getting people together and enabling them to explore the changing landscape of social care and health as equals. The board version of Whose Shoes?® has been used with cancer and other specialist health professionals; in services for older people, including people with dementia; in housing and Extra Care settings; with people with learning disabilities; and with people with mental health issues. The University of Wolverhampton has used Whose Shoes?® as a tool to support a major Workforce Transformation project across four Local Authorities (Walsall, Dudley, Sandwell and Wolverhampton) and corresponding Primary Care Trusts. This project set out to encourage culture change through partnership working, shared learning and personalised, seamless service provision. It included developing a care pathway for frail elderly individuals and people with dementia. This work has helped develop new content for inclusion in the electronic version, developed in partnership with Think Local, Act Personal (TLAP) to support the 'Making It Real' programme. The electronic version of Whose Shoes?® has been built in partnership with Think Local, Act Personal (TLAP) aligned to the key themes, principles and 'I' statements of 'Making It Real'. We encourage care providers to sign up to 'Making It Real' and to use Whose Shoes?® to work with people using your services to identify your 'top 3 priorities' ... and then move on to co-produce truly person-centred solutions. 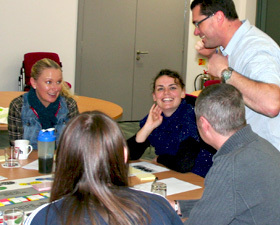 Brilliant..Personalised..Creative, Effective & Stimulating Facilitation!" 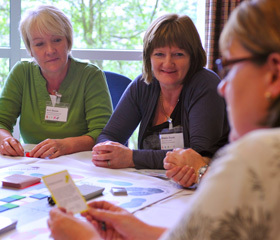 All those who participated in the Macmillan Cancer Support workshops found the Whose Shoes tool extremely useful, particularly when used to deal with challenging topics and difficult questions." The tool enables users to explore different perspectives in a constructive way." What a privilege and responsibility it is to train the health and social care workers of the future! Universities and colleges using Whose Shoes?® say it helps their students bridge the gap between academic theory and the reality of practice placements. 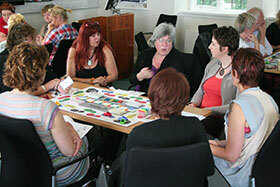 Many are using the tool to invite service users and practitioners to come and facilitate or join in. Help your students to engage and empathise with key partners: people using services, carers, staff, managers, commissioners and service providers. Key benefits / learning outcomes – help your students to…. learn examples of good practice – what are people doing to make personalisation a reality? "We have found that by being able to put ourselves ‘in the shoes’ of people who use services and carers, as well as managers, front-line workers and care providers, we are better able to understand the complexity of the personalisation agenda and how we can make effective contributions to our workplaces"
This is an excellent way of exploring the range of views held in relation to personalisation." It is fun, non-threatening but very challenging. It’s a great teaching tool." In Nottinghamshire, the Self Directed Support Team love the game and are becoming sufficiently confident to champion it wider across the adult care workforce now." It is so exciting that we have good robust collaborations with service users and carers and are working hard now to develop collaborative learning with health colleagues …I feel the game can support us here. " Thank you for giving this learning opportunity. As a student and almost a newly qualifying social worker, the game developed my understanding of the personalisation agenda and how it’s implemented in practice." The discussions when playing the game outlined some dilemmas and challenges within practice. I now feel equipped, taking on what I learnt within my future practice and remain committed to the values of the personalisation agenda." Whose Shoes? was an excellent tool to use as part of our Inter-Professional Learning Workshops with nursing and social work students. It really helped the students to explore each other’s roles and it helped to create really useful discussions regarding partnership working"
It gave me more of an understanding of nurses' roles; I enjoyed the game, it created good discussions"
Practice Education Facilitator, Community Health Stockport. The impact Whose Shoes? 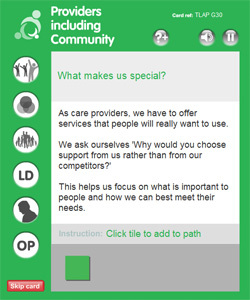 can have re developing User and Carer knowledge and understanding about the Personalisation Agenda is fantastic - and with the additional social outcomes it has for partnership and peer learning - its phenomenal. People absorb more when they are having a good time!!!" We have really loved this session. It's a far more creative approach to learning than anything we normally do. We will ask our lecturers to purchase it!" As both a freelance and an employed development worker, I have been pleased to introduce Whose Shoes? to citizen groups keen to make their own experiences available to policy makers and professionals as part of working towards more personalised responses to individual support needs." Gill gave us an inspirational session and responded positively to the differing views of our participants - who were from a wide variety of care sectors." The feedback we received for this training event was overwhelmingly positive - even from those individuals who were not initially certain about the concept and the material." I can whole heartedly recommend Gill and her company Nutshell Communications as a Value for Money champion around Personalisation, Service User involvement and positive ways forward for everyone involved in care provision." Gill has produced a thought-provoking resource. 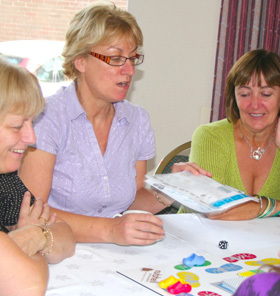 By bringing people with different viewpoints together, you have an automatic exchange of perspectives and powerful exchange of ideas"
Gill is a very creative, person-centred worker whose board game Whose Shoes is an excellent tool to stimulate discussion, and sometimes argument, in addition to enjoyable learning around all the key issues and themes of personalisation. Her creative scene setting is worth participating in if you get the chance"
Carrie created a wonderful graphic record of the session which has just now gone up on our wall for all staff to see." The session included Carers, Experts by Experience, Social Workers who all looked at personalisation issues from different perspectives. 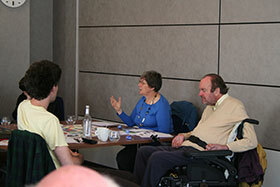 It was a very energising and engaging workshop the benefits of which are still being experienced." 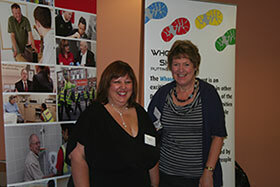 Whose Shoes?® is being used by many care providers - either as independent customers or at events hosted by membership groups or by local authorities. Whose Shoes?®, including the new electronic version, provides a handy means of exploring the changing landscape of social care and health in a wide range of settings. It provides a powerful tool to explore issues within your organisation (eg a team away day) or to work with your clients and partners to develop more personalised practices. It is a great tool for starting the co-production process. Whose Shoes?® has been used with cancer and other specialist health professionals; in services for older people, including people with dementia; in housing and Extra Care settings; with people with learning disabilities; and with people with mental health issues. The University of Wolverhampton has used Whose Shoes?® as a tool to support “Project 9 - Workforce Transformation”, a major project across four Local Authorities (Walsall, Dudley, Sandwell and Wolverhampton) and corresponding Primary Care Trusts. This project set out to develop new ways of working, facilitating partnership approaches across four health economies in order to encourage culture change through partnership working and personalised, seamless service provision. The university has provided research and evaluation expertise and acted as the learning hub for shared learning, using a “hub and spoke” approach. This has included developing a care pathway for frail elderly individuals and people with dementia. We encourage care providers to sign up to 'Making It Real' and to use Whose Shoes?® to work with people using your services to identify your 'top 3 priorities ... and then move on to co-produce truly person-centred solutions. Gill demonstrated her fantastic board game 'Whose Shoes?®' to over 50 senior managers of social care provider organisations delivering across Glasgow. 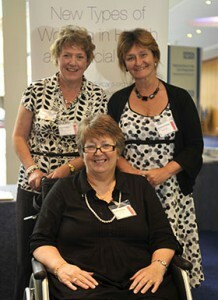 Gill's enthusiasm and passion for the subject of Personalisation and Self Directed Support shone through." The phenomenal feedback about Gill and the game was astounding ..."
Gill is as an entrepreneurial change maker! She helped us in our aim to 'nudge' the concept of personalisation & SDS onward and upward with staff and organisations in a way that encourages intelligent, thought-provoking conversations and thinking differently." We bought the board game Whose Shoes?® - it is very good indeed!" This is a fantastic tool which I've used many times to guide staff through change, interact with commissioners and explain to service users about what services are available." It enables discussion and flow of ideas for all - it's fun and makes you think outside of the box. Gill is the creator of something truly wonderful, which has the opportunity to develop and get better and better!" Gill Phillips understands that implementing personalisation is complex, as is meeting everyone’s needs and aspirations in life. Whose Shoes?® reflects that complexity. As a facilitation tool, it is empowering and insightful to all who engage with it - an ideal tool to kick start some proper co-production!" Whose Shoes?® is such an innovative approach to a sensitive subject and 100% fits with the learner-centred and brain friendly approach that First Class Learning and Development is so passionate about." The rich conversations that took place meant that potentially contentious or sensitive issues were explored in greater depth without people feeling awkward. This resulted in good quality information being gathered in a relaxed environment." I very much look forward to being part of such innovative events with Gill and Nutshell Communications in the future!" "Macmillan Cancer Support commissioned Nutshell Communications to run a number of workshops at an event for Macmillan professionals from across the UK. All those who participated found the Whose Shoes?® tool extremely useful, particularly when used to deal with challenging topics and difficult questions. The tool enables users to explore different perspectives in a constructive way." "Whose Shoes?® was a fantastic way to discuss the issues of personalisation in a friendly, comfortable, non-threatening environment. The workshop Gill ran for us had such an impact on our work that we bought 2 copies of the game, which can be used to broaden thinking (and horizons) across the wider organisation. Well done Gill - an invaluable resource for all"
"Supported housing staff at East Midlands Housing Association spent a thought provoking day considering how to offer more personalised services within their organisation. What would future services look like? What are the barriers and how to overcome them? What actions are needed? Whose Shoes?® made the subject fun and interactive. The day was very well facilitated and was also captured for us by the graphic artists. Now we have a great record of what we achieved and what we have to do to make housing related personalised services a reality for our customers". "I really enjoyed playing the game. 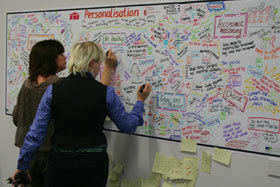 It was very absorbing and it got me thinking about what personalisation really means. I think it is such an innovative way to get a message across that we have a tendency to over complicate"
We encourage providers to sign up to 'Making It Real' and to use Whose Shoes?® to work with people using your services to identify your top 3 priorities ... and then move on to co-produce truly person-centred solutions. On placement with a housing provider who attended a Whose Shoes?® workshop ... and they did indeed persuade their lecturers to become customers!